I don’t normally read much in the way of mysteries or crime fiction. I tend to find them a little too rat-a-tat-tat from one plot point to another. Granted, sometimes that kind of formula can be rather comforting to my linear way of thinking, but not too often. What I never find comforting, however, is that so many (most?) crime fiction is about murder. I am not so squeamish that I can’t abide reading about murder or other morally repugnant events, but most mysteries treat murder so nonchalantly it makes me wonder a bit. 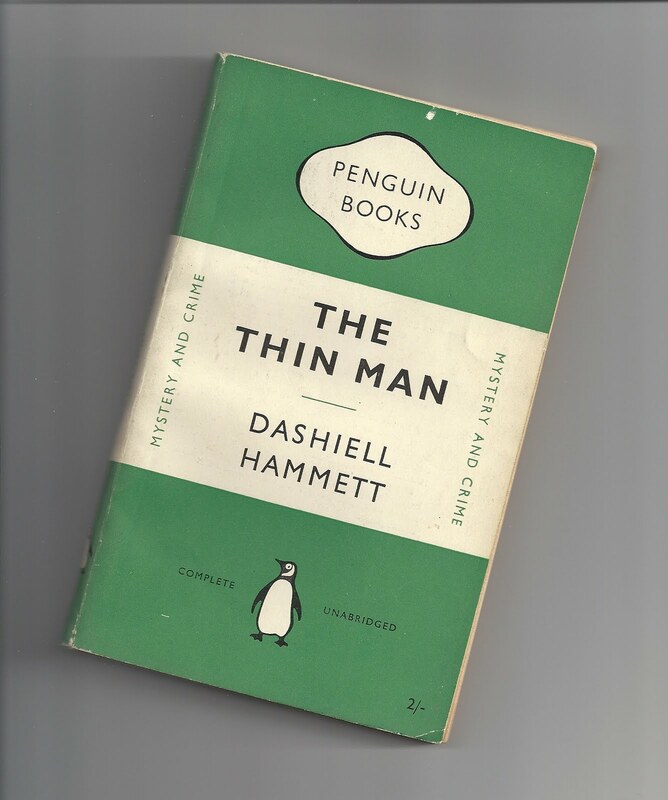 Knowing that The Thin Man is a bit of a classic, I satisfied my desire to own a classic green Penguin by picking this up when we were in London in November. The book is the first written by Hammet starring the husband and wife team of Nick and Nora Charles. A dynamic duo who don’t let a page go by without having a cocktail. The book reads like an old black and white Hollywood film which is why I put the film version at the top of my Netflix queue. You know the kind of thing, speakeasies, gangsters, dames, and people named Studsey. The thing that attracted me was less the “glamour” of this world than the now archaic way of communicating–both verbally and technologically–and the effort to gather information. This was not the world of crime databases and Internet searches but rather good old fashioned gum shoe detective work. And don’t even think about civil liberties. Search warrant? Who needs it? Although I did enjoy reading The Thin Man, I was a bit surprised that the many twists and turns melted down in the final five or so pages to a denouement that only barely tracked with the action of the preceding 178 pages. It is not that one should be able to predict the outcome of a detective story, but I certainly would have appreciated seeing Nick make some of the connections along the way rather than having everything miraculously explained all at once in the final minutes like some live action version of Scooby-Doo. To paraphrase Gertrude Stein: for those that like this kind of thing, this is the kind of thing they will like. I always thought Abraham Lincoln said that, not Gertrude Stein. I hope you have at least as much fun with the movie. While I am a fan of detective stories and Dashiell Hammet, I'm going to go there and say the movie may just be better than the book. The cast is just so darn charming and sophisticated, and the dog is terrific. I've not read the book, but the movie is one of my all-time favorites. I was obsessed with it in high school and wanted to be Myra Loy when I grew up (when I didn't want to be Kate Hepburn). But yeah, even in the movie, the mystery hardly makes any sense; it's all about the dialogue and atmosphere. Never read the book, but the movie was great fun. As Teresa said, it's enjoyable not so much for the mystery, but for the banter (and the dog!). I actually am planning to read Hammett's The Maltese Falcon soon, and I haven't read anything by him before. Appreciate all your points here including the humorous Scooby Doo reference but what really sticks out is the part about how murders are treated in such an offhand, “nonchalant” manner in most mystery novels. I've always thought the same, and while I understand the reasoning behind this, it has always struck me as strange also. Or cold in some cases. Haven't read the book, but loved the movie. (I love this old Penguin copy). CB: You know I heard the quote years ago in a one-woman show about Stein. I assumed that she said it. But a quick Google indicates that you are correct. Teresa: I can easily see how the movie might be about something other than the mystery. Christy: I had forgotten that he also wrote The Maltese Falcon. I haven't seen or read that one. Frances: People just love murder. Susan: I was never a fan of Scooby Doo. Diane: I can't wait to see the movie. I have it at home right now, but not sure if I will be able to watch it with my parents visiting. They don't really like old films much. I can't speak specifically to Hammett because, gasp, I've never read him. I'm weak on the older/classic mystery writers, although I'm working on it. That said, mystery is far and away my favorite genre, and mostly the only genre fiction I read. It's funny to read that you don't like it. It's fine – we all like different things – but I read that you and I like the same things a lot, too, so I just find it interesting to contemplate where the differences come in. Now I shall have to read The Thin Man and try and puzzle it out. I find classic covers like this one so enchanting — and though I'm not big on crime fiction, the premise is interesting. Oh I love this book, and this film! The film in particular captures a playful spirit between Nick and Nora. I own all the Thin Man films, and watch them regularly. I just found out that Johnny Depp is slated to star in a period remake of the Thin Man with the 3rd Pirates movie director. I am not sure how I feel about that. William Powell DEFINES Nick Charles….Depp's version could be really good or *really* bad. PS am envious of your Penguin edition :) In the nicest way, of course.